Investors are meeting in London on Tuesday to decide the fate of household goods giant Steinhoff. The firm owns 6,500 retail outlets in 30 countries, including the UK's Poundland and furniture chains Bensons and Harveys. One person in the spotlight is Christo Wiese - Steinhoff's former chair and its largest shareholder. He's one of South Africa's richest businessmen - and one of its most respected, with a reputation for having something of a Midas touch. Mr Wiese holds a stake in investment firm Brait SE, which is a majority shareholder in several other UK businesses including Virgin Active and fashion retailer New Look. But since the scandal emerged earlier this month, the fall in the value of his investments has wiped out a large chunk of his net worth. Forbes estimated his fortune has plummeted from $5.8bn to $742m. Mr Wiese was appointed chairman of Steinhoff in 2016 and had been a board member since 2013. But Mr Wiese resigned from his post last week to ease concerns about possible conflicts of interest between being chairman while also being Steinhoff's biggest shareholder. His son, Jacob, also stepped down from the board. 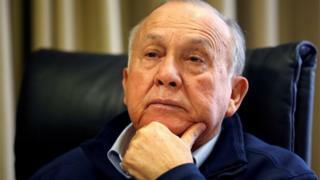 Christo Wiese holds a 22% stake in the firm, a holding that came from the sale of his clothing retailer Pepkor to Steinhoff in 2014 for a combination of cash and shares. Mr Weise started Pepkor in 1965 but is best known for expanding South African grocery chain Shoprite from just six shops in the 1970s to hundreds of shops across the continent. The 76-year-old was also instrumental in turning Steinhoff into a global household retailer from its humble roots selling cheap furniture imported from communist eastern European countries. Steinhoff owns three British firms: discount retailer Poundland, and furniture chains Benson for Beds and Harveys. The South African tycoon also holds "significant interests" in investment company Brait SE, which has a controlling stake in three other British businesses: supermarket Iceland, fitness group Virgin Active and fashion retailer New Look. Steinhoff has been under investigation for suspected accounting fraud by the state prosecutor in Oldenburg, Germany, since 2015, the year it listed on the Frankfurt stock market. Prosecutors say four current and former managers are under the spotlight. The firm has previously said the investigation is looking into whether revenues were booked properly and taxable profits were correctly declared. On 5 December, Markus Jooste resigned as Steinhoff's chief executive and the firm said it would be launching a probe into accounting irregularities. Its share price subsequently fell 63% in one day. On 7 December, auditors Deloitte said it wouldn't sign off on the company's latest results, prompting Steinhoff to announce it would need to restate its financial accounts for 2016 as they "could no longer be relied upon". The scandal has prompted several unnamed banks to sell 98.4 million Steinhoff shares they used as security against a €1.6bn loan to Mr Wiese to fund his purchase of additional shares in 2016. This has reduced his total stake in the company. Some red flags had been raised about Steinhoff's accounting practices in the past. In 2007, a report by analysts at JPMorgan Chase said Steinhoff's accounts lacked "pivotal information" about its sources of revenue. But it's argued that Mr Wiese's glowing reputation in the business community helped to stave off concerns about the company's financial health. "There was this belief that Christo had the Midas touch and that whatever he invests in just escalates in price, and you just follow the calls he makes," Magda Wierzycka, chief executive of South African financial technology firm Sygnia Investment Management, told the BBC. But with investors now scrambling to decide whether to support Steinhoff, or dismantle it, Mr Wiese's reputation has taken a dent. To ease concerns about its financial stability and recoup potential losses, Steinhoff has put €1bn of assets up for sale. It is also reportedly considering selling its stakes in PSG Group and KAP Industrial, worth $1.4bn. In addition, the firm's subsidiary Steinhoff Africa Retail says it's preparing to repay $1.2bn it owes to the parent company. What could happen to UK businesses affected by the scandal? Through Mr Wiese's stakes in Steinhoff and Brait SE, a number of British firms may be exposed. Shares in Brait SE have dipped in recent weeks, but not as sharply as Steinhoff's. "I think these businesses stand on their own and trade reasonably robustly. The only impact has to do with [market] sentiment," says retail analyst Richard Hyman. He adds: "Stock markets are not famous for their rationality. I'm not in any way saying this is a storm in a teacup. I'm saying this is something in a teapot and no-one knows quite sure what it is yet."